The ongoing drought that is afflicting California and other parts of the country should have everyone evaluating their landscape water usage. Potable water is a finite resource, and our lawns and irrigation systems can be large guzzlers. 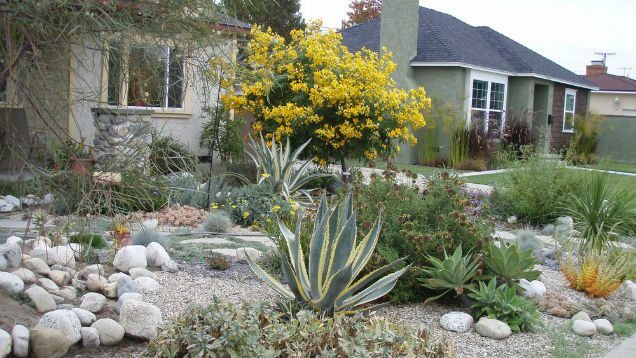 Here’s how to convert your lawn to a more water efficient landscape using drought tolerant plants. In addition to consuming water, lawns are often treated with chemical fertilizers and pesticides that can have a negative impact on the environment. 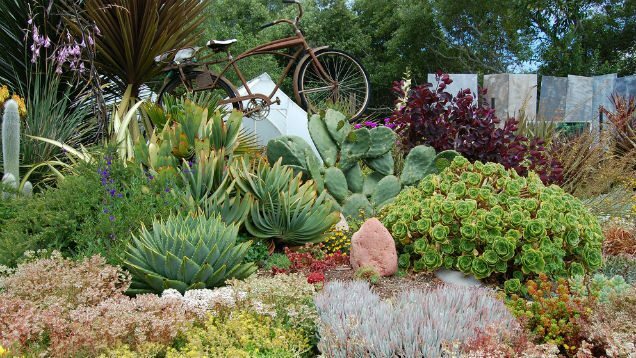 Drought tolerant plants require less maintenance than a lawn and can consist of native grasses, wildflowers, and succulents. Don’t rush to tear up your lawn just yet. You’ll need to fill the space with more than just flower beds and potted plants. Do your research, and find yards and landscapes that appeal to you. Speak to homeowners you see working on their yards, and inquire about about their water usage and plants they used. 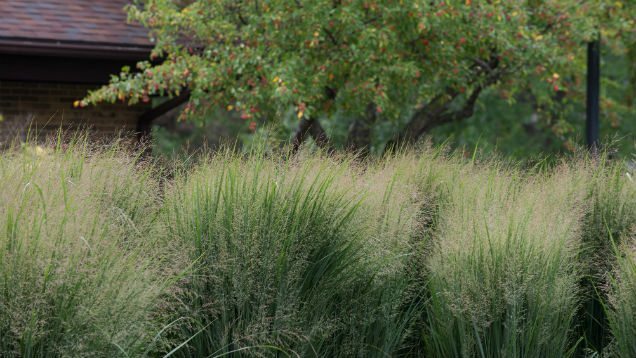 Your neighbors can also be a great resource for finding reputable landscape designers. Beyond plants, you will also need a plan for other outdoor elements like paved walkways, stone and gravel beds, and water drainage systems. Rent a sod cutter to assist in removing your lawn. You can sell or giveaway your sod on Craigslist instead of throwing it away. Once all of the lawn is cleared away, build your landscape features such as hills, flower beds, and walkways. 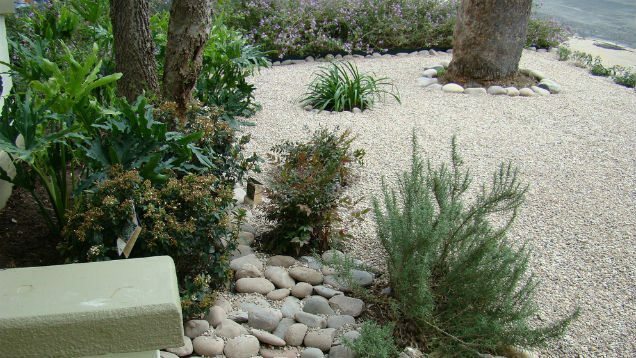 Keep in mind that drought tolerant plants require excellent drainage and can die if left in standing pools of water. 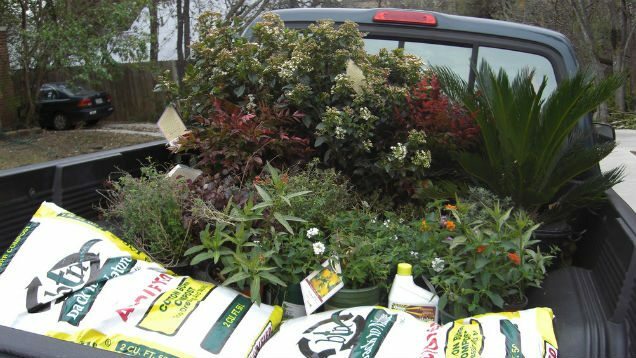 A plant nursery can help you identify native plants in your area and sell and source these plants for you. A native plant will be as adept at surviving in your yard as it is in an open field. No fertilizer or pesticides are needed and water demand for native plants matches what they get from the environment. Native plants grow quickly and look more natural in your home setting. They are also dynamic and change with the seasons, so you no longer worry about a lawn turning brown. Take note of plants that can grow and spread quickly (vines and other climbing plants), which can push out other plants that are placed near them. Some native plants may only be available as seeds which require attentive hand watering until them become established. After converting your yard to native plants you will notice an uptick in wildlife returning to your yard. Birds, butterflies, and bees may flock to the natural habitat you’ve created. Add a birdhouse to accelerate the process. If you live in LA you could be in for some cash if you tear up your turf as the Metropolitan Water District of Southern California on Tuesday voted to increase funding for its turf-removal program, as more and more residents and businesses swap water-guzzling lawns for more drought-tolerant landscaping. The MWD will boost its turf-replacement budget by $350 million for one year, but will also change certain terms and conditions of the extremely popular program. The district voted to cap the total reimbursement for residential customers at $6,000, paying $2 per square foot of lawn removed. Photo by Emmanuelle Bourgue, Steve and Michelle Gerdes, FarOutFlora, JP Newell, and Art Jensen.